Next time someone tells you their life is an open book, get them to contact Brenda Shanahan or Trudy Blumstein. Shanahan, Director, New Residence Hall; and Blumstein, Academic Associate, School of Social Work; are the co-founders of McGill’s Living Library, a project that provides people with the opportunity to access “living books” to learn first-hand about someone’s personal life experiences. Next time someone tells you their life is an open book, get them to contact Brenda Shanahan or Trudy Blumstein. 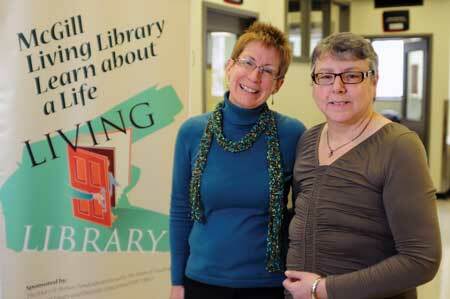 Shanahan, Director, New Residence Hall; and Blumstein, Academic Associate, School of Social Work; are the co-founders of McGill’s Living Library, a project that provides people with the opportunity to access “living books” to learn first-hand about someone’s personal life experiences. The people who act as living books prepare a story about themselves – sometimes a lifelong journey or maybe just an important period in their life. They can come from all walks of life and the story they tell is of their choosing. With the help of volunteer “librarians” the readers select a title, then meet with their “book” to listen to and discuss the story. Shanahan is quick to point out that this is not a seminar series. Most of the interactions are one-on-one or a couple of readers at the very most with a given book. Books are given a little coaching to help them get started and to review their material prior to the event. “Above all, we want to create a safe and comfortable environment,” she says. The Living Library movement originated in Copenhagen, Denmark in 2000, the brainchild of a group of creative youth workers trying to stem the tide of neo-Nazi violence directed toward the growing populations of refugees and immigrants in that country. Spurred on by the senseless stabbing of a friend, the founders designed an initiative in which stereotypes and prejudices could be broken down through one-on-one or small group encounters.